♥ FREE State Beach Permit! ♥ FREE Shared Photo Rights! Complete package coordination with unlimited support- Included! ~ Unlimited telephone and email consultations! ~ One full hour of professional photography! 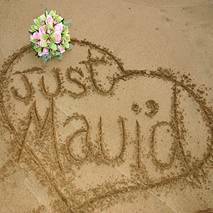 ~ On site wedding coordinator! We can also book or refer your in-room hair & make-up services, receptions, and restaurants, spa & massage appointments, your activities and more! * Don't see a service listed above that you'd like in your package? No worries - You may add other wedding & reception services to your package from our “a la carte menu.” See a service in your package that you don't want? We can omit it! Subject to availability and our terms & conditions. Up to 20 guests. No distance charges as far as Kamehameha Iki beach in Lahaina. Far Westside charge of $75 beyond Lahaina. Wedding limited to 60 minutes, including photography. Limit 20 total persons, including bride & groom, at $895 price. If you have over 20 guests, you must purchase an additional 30 minutes of photography at $150 to adequately cover the group photography and a wedding/guest attendant is required at $175/hr per 20 guests, plus tax, and a private venue is strongly recommended for weddings with over 20 persons in attendance so that chairs may be set up. A free beach permit is included for up to 20 persons in this package. It is your responsibility to make sure the specials are outlined in your wedding package services Event Statement. If your event date if less than 60 days from your booking date, you must prepay the package and there is no discount for prepayment. If it is over 60 days in the future, we will accept a $400 non-refundable deposit to book/confirm package and date/time. If it is over 60 days, and you wish to prepay this package, you will receive a 5% discount (Sorry, not combinable with other offers or specials and must be mentioned at time of booking to qualify). No more than 2 payments will be accepted for this package - the original $400 deposit, then the remaining balance due 60 days prior to the wedding. *** Festivity Pack - The "Hawaiian Wedding Song" and other Hawaiian classics & Island Tunes to be played on ukulele and sung live with sacred Hawaiian wedding hula danced to the song. 30 min and 1 hula dance. This option only becomes a part of your package if you pay the $300 + tax upgrade charge. **** Digital Photography - Included in package: 80-120+ pro-digital hi-res exquisite images (photographed by an experienced, quality photographer) made available to you through full-resolution digital download (ready within 30 days). No prints or album included. 60 minute limit. For an additional 30 min added to 60 min included in package (for group photography or bride & groom portraiture) add $150 + tax. For recommended (but not required) digital enhancement and optimization to maximize photo beauty add $150 to package. Includes FREE shared photo rights, so you may do whatever you please with your pictures! We also offer fabulous custom designed published coffee table photo books starting at $295 + tax. *** MULTI-MEDIA OFFER: Digital EDITED Video on DVD upgrade and Web video for only $395! At this amazingly low price, anyone can afford to benefit from both of these wonderful services!